Yesterday we posted several team updates about the upcoming Ardennes Classics. I got a couple more today. With the cobbles of Belgium and France in arrears, the EF Education First-Drapac p/b Cannondale has dispatched a team of climbers to the Ardennes races. The trifecta of Amstel Gold, La Flèche Wallonne, and Liège-Bastogne-Liège make up block of racing that’s an entirely different challenge, or, as Alex Howes puts it: “They’re beautiful races. They’re left right up down all day. You’re totally switched on for 6.5 hours for Amstel and Liège." The Amstel Gold Race opens up the week and serves as something of an in-between: Some riders from the cobbled races line up for Amstel while others wrapped up at Roubaix. Sep Vanmarcke will take the start along with Matti Breschel, Lawson Craddock, Alex Howes, Logan Owen, Rigoberto Uran and Mike Woods. The team will be ready for one kind of Amstel with Vanmarcke and another entirely with Uran. 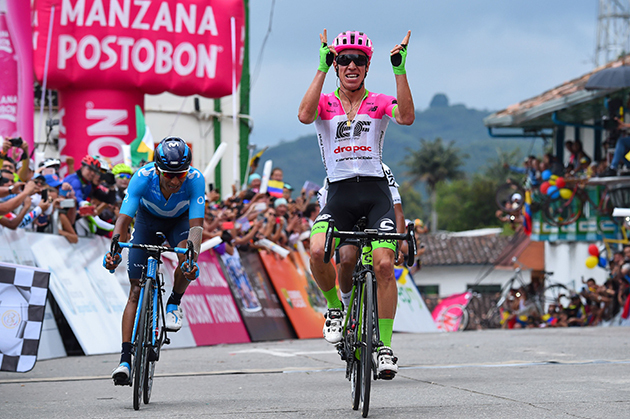 Rigoberto Uran (shown racing in Colombia earlier this year) will be on the Amstel start line. La Flèche Wallonne will come down to positioning into its fabled climb, the Mur de Huy (average gradient, 9.6 percent; maximum gradient, 26 percent). Woods has finished 12th and 11th at Flèche and combined with Uran provides the team with options. The pair will be joined for the mid-week race by Craddock, Howes, Kim Magnusson, Dani Martinez and Pierre Rolland. Martinez makes his return to racing after suffering a concussion in late March. 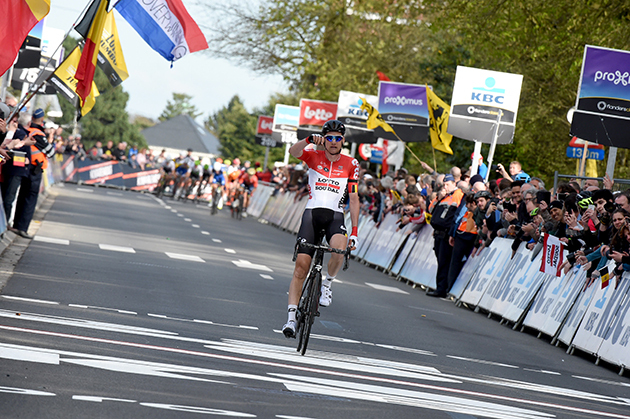 This Sunday the Amstel Gold Race will take place, the first of three WorldTour Ardennes Classics. The race of almost 263 kilometres contains 35 hills, including three ascents of the Cauberg. Since last year the Cauberg is no longer the last hill in the race. The Amstel ends with a local lap of 15.7 kilometres with the Geulhemmerberg and Bemelerberg, that last hill at seven kilometres from the finish. Lotto Soudal leaders Tim Wellens and Tiesj Benoot both hope for an animated race. Line-up Lotto Soudal: Tiesj Benoot, Nikolas Maes, Tomasz Marczyński, Marcel Sieberg, Tosh Van der Sande, Jelle Vanendert and Tim Wellens. Sports directors: Mario Aerts and Herman Frison. 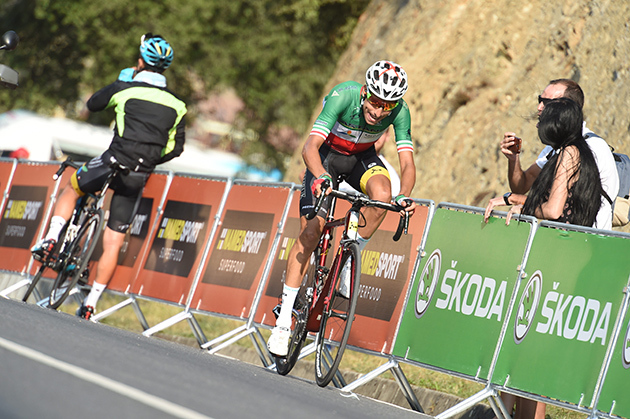 The UAE Team Emirates is built entirely around its stage race star Fabio Aru for the Tour of the Alps this April 16 to 20. “I’m going to find some tough racing at the Tour of the Alps, where I want to do well and prepare in the best possible way with an eye on my big goal, the Giro d’Italia,” the Sardinian climber said. Roster: Fabio Aru (Ita), Valerio Conti (Ita), Kristijan Durasek (Cro), Vegard Stake Laengen (Nor), Przemyslaw Niemec (Pol), Simone Petilli (Ita), Edward Ravasi (Ita). Sports directors: Marco Marzano (Ita), Mario Scirea (Ita), Paolo Tiralongo (Ita). DAYTON, Ohio (BRAIN) — Huffy Bicycles has announced a new line of bikes to be sold exclusively through IBDs: Batch Bicycles. "I asked my team to find the white space," said Huffy CEO Bill Smith. "Dealers told me there are opportunities for incremental business, in between the high end of mass-market bikes and the low end of specialty bikes. Huffy is in a unique position to leverage its strengths and provide that. "We're a well-run company with 126 years of bicycle experience and significant buying power. We don't carry overhead of mainstream IBD brands, such as the costs of a large sales force, catalogs, race team sponsorships and floor financing. We're able to make a well-spec'd product, and offer dealers great margins, without the need for minimum buys, presale commitments, inventory requirements or complicated discount structures," he added. Smith began a dialogue with IBDs after attending 2017's IBD Summit and Bicycle Leadership Conference. In a panel discussion at the IBD Summit, Smith said Huffy faced many of the same challenges as the IBD industry. He also began recruiting IBDs to act as Huffy warranty service centers. Huffy launched a new Service Center program in 2018. Batch Bicycles is being run by industry veteran Bruno Maier, who rejoined Huffy and parent company United Wheels last year. The brand will launch five categories of bicycles at Interbike in September: a comfort bike, a commuter model, a beach cruiser, a mountain bike and kids' bikes, all made with aluminum frames and spec'd with Shimano drivetrains and double-walled aluminum rims.